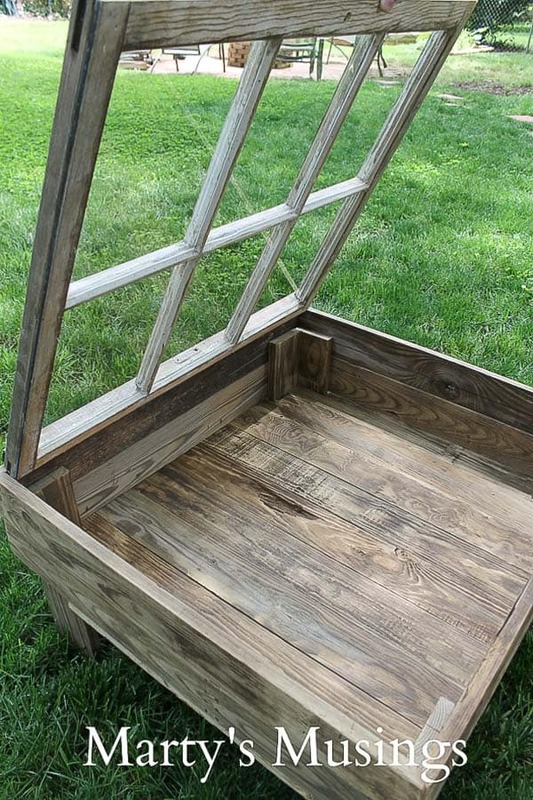 This DIY tutorial explains how to make a window table for the rustic look for practically nothing. Great furniture idea for the repurposed shabby chic look. You know how it is. You’re hiding in the minivan and really don’t want to talk to anyone because your hair’s a mess and you haven’t changed out of yoga pants in three days. 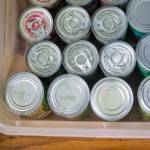 You’re surfing the net, waiting for your kids in the carpool line or at their ball game. While you’re losing yourself in your phone you find that perfect Pinterest project that’s going to change your life! Because you know Pinterest makes everything better, like somehow “Pinterest” is the perfect mama with her act together who never yells at her kids, has a home cooked dinner on the table every night and even wears MAKEUP! Y’all do know Pinterest is just a way to bookmark things and real people actually create all those beautiful ideas you and I pin? 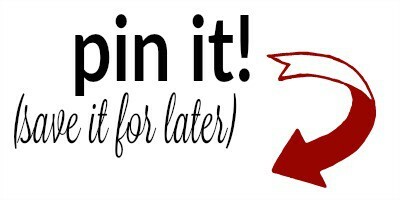 Anyhoo……about four years ago that was my story because I loved all things Pinterest. 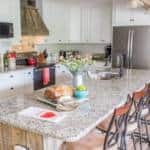 I was coming into a new season of life as my oldest two were getting married and the end was in sight for our youngest two and our homeschooling days. 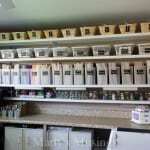 I never had much time to decorate (hello, 5 kids, pets, homeschooling, no life!) but I longed for a home that was authentic and unique to me. 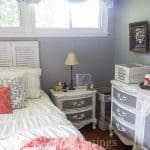 I happened to find a little “honey do” project that helped me discover my style and changed our lives at the same time. 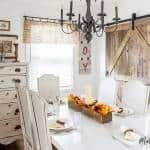 Little did we know my husband’s first attempt at repurposing would forge a new career for mama and a love of transforming wood into beautiful home furnishings for papa. 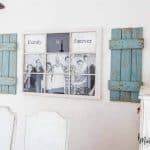 Here are all the details on how to make a window table using fence boards, still one of my favorite DIY projects! I was supposed to take pictures throughout the build, but the idea of cleaning my hands and taking a camera pause at every step was inconceivable. The picture series below begins after the boxing and legs had been completed. That was an interesting process, since I needed to maintain space around the frame of the sash so it would open without pinching but not really worth going into the details. 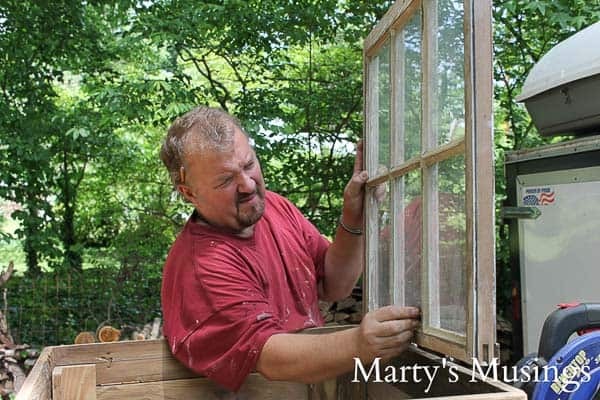 The window sash required the most prep time. I wanted to retain as much of the character as possible while bringing the different woods closer together in color and texture. Might be hard to tell from the picture, but the chief decided she wanted the glazed side turned to the bottom. That is the shallower face, but by doing it this way, the white glazing is hidden. So, the original inside of the window is the side turned up. I was really pleased with the design of the inside storage in conjunction with the hinged window top – especially since I don’t work off plans. I had considered using a solid piece of stained 1/4″ plywood I had laying around for the bottom of this compartment. 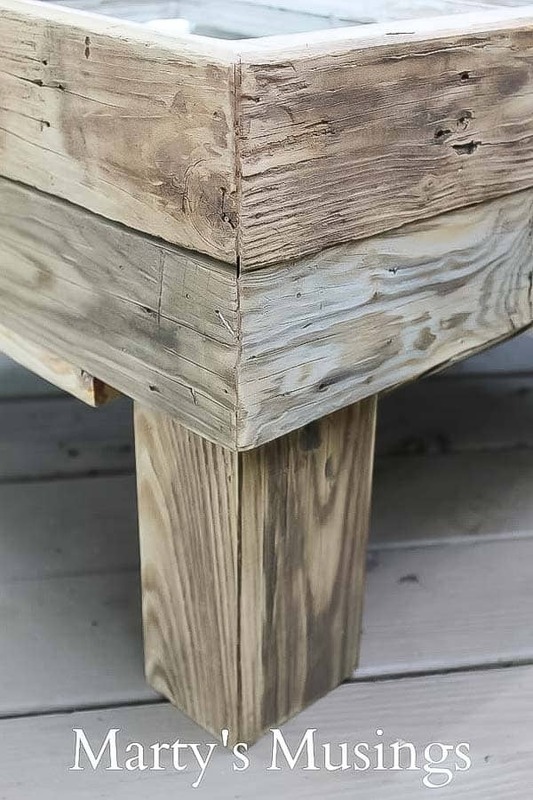 I didn’t want the table to be too heavy, and this was the only design spot to compromise a bit on the material used. However, I gambled and continued the fence slat theme, beveling the ends at a 45 degree angle so they disappeared. I was amazed at how clean the windows came…probably should have checked that first thing! Note to self! 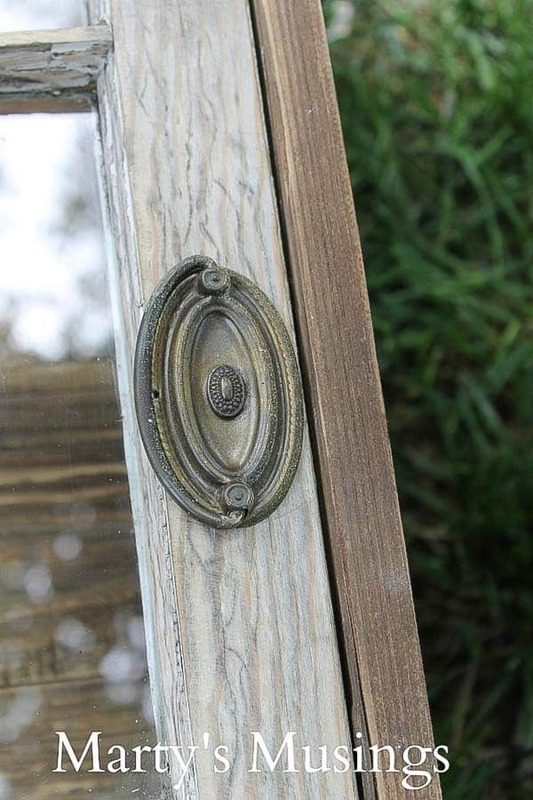 The last thing I wanted near the end was nice, shiny hardware on this rustic window table. 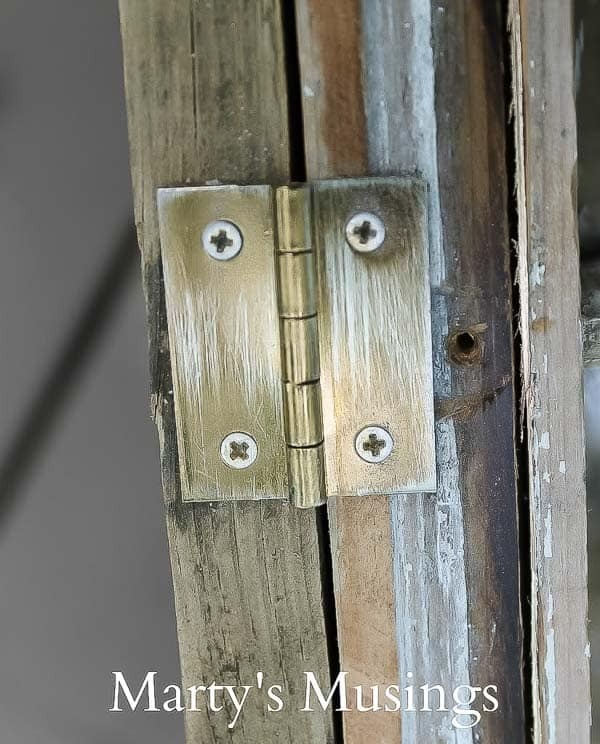 I was unable to find any in the workshop, so I had to break down and buy a pair of brass piano hinges and then just distressed them with sandpaper. Drats! The idea was not to spend money on these things! I did have a pile of old cabinet handles and this was the perfect choice. A single post installation with a bolt through the hole and the end was in sight. My favorite element of the two tables I’ve made is the character of the wood. It’s all terribly marred and full of holes and divots but absolutely beautiful. The big drawback is warping. Each piece has to be selected with purpose, and even then the angles don’t always turn out perfect. I will confess to a bit of wood filler at a corner or two! 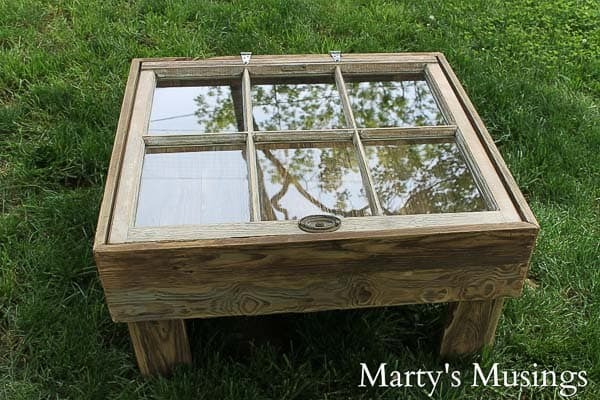 So, even though it came right out of my head, this window table turned out pretty well. Of course, I learned what to do and not to do for next time (and I know there will be a next time.) Who knows what I’ll use…a door, a shutter, or maybe some old cedar shingles. 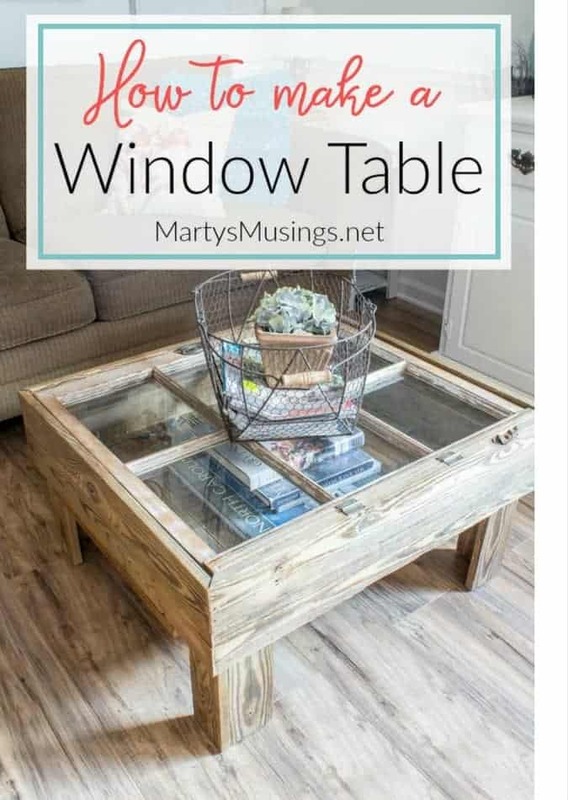 Marty: Even though we’re in the middle of gutting our kitchen and creating a totally new space in this room (you can read all about the dream and how to save thousands of dollars here) the one thing that will remain is the window table! The DIY project that inspired our journey continues to hold a place in the center of our home and hearts. 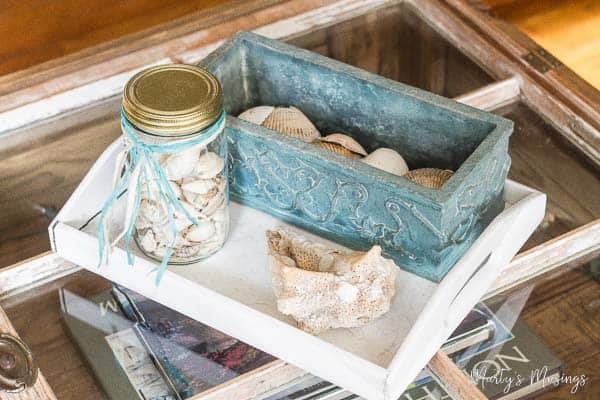 I’d be grateful if you’d share this post on how to make a window table so other folks who want to create an authentic will be inspired as well! 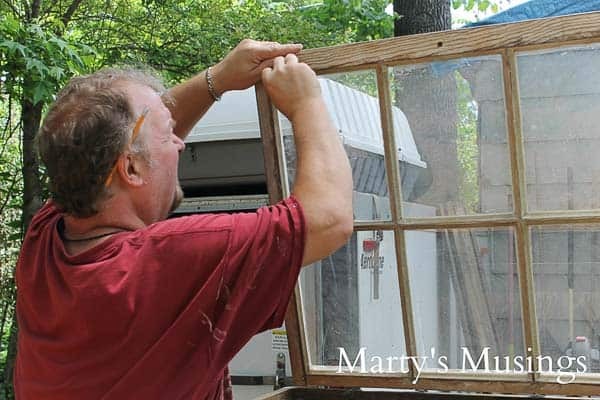 I’ve seen some great uses for old windows but I have to say this is one of the best. Since I live by the sea, I would put seashells under the glass. Great job! 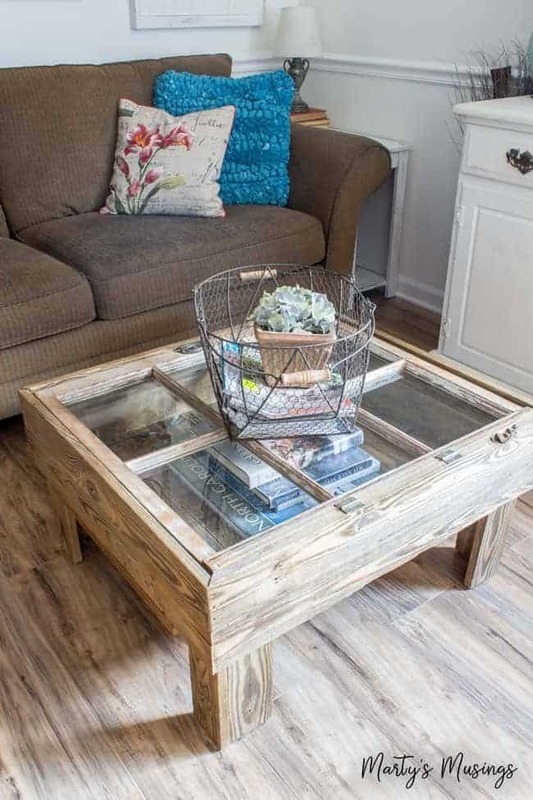 This is the best idea ever for a coffee table! I have to say with 3 boys my table is shot. I hope to try and make one of these. This way if it gets banged up, it will add to the vintage look. Hi, Clayton. Sorry it took me a bit to get back to you. With this particular window the pane is definitely strong enough for a mug or glass or some books. I would just test out the window before I went to the work of making the table. When my toddler grandson comes over I put a card table over the top to prevent him from breaking it or getting hurt. Let me know if you decide to make it and how it turns out. Love this. I plan on making a couple. Good luck, Tami. I still love my window table! My name is Anna and I am the Digital Marketing Specialist at Feldco Windows and Doors. 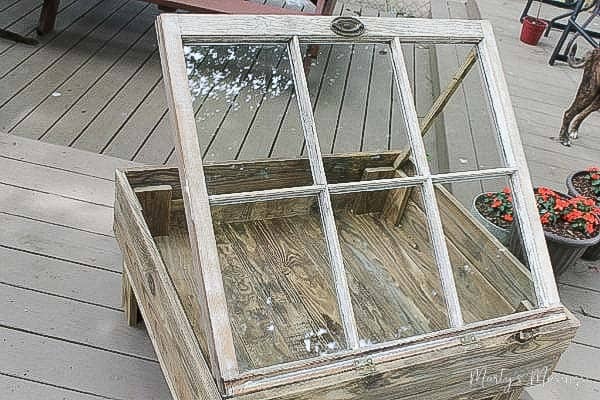 I am writing an article for our blog titled “12 Creative Ways to Repurpose Old Windows”. 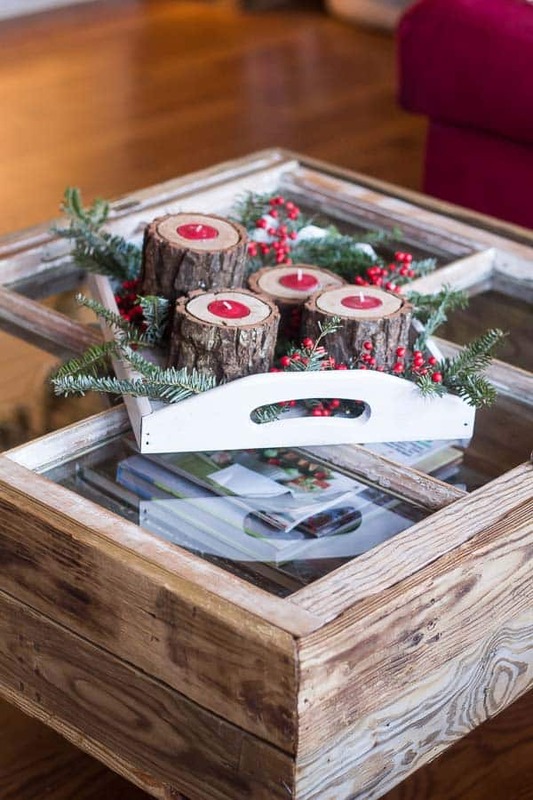 I loved your window coffee table idea, and I referenced your blog in my article. I was hoping to use an image from your site to compliment my article. Thanks for your awesome inspiration! What was the spacing you needed around the window to keep it from binding? Great job. Just love your work. Thanks so much, Leslie! I appreciate you reading my blog! This is so pretty! What a great piece! Thanks, Kim! It’s still one of my most favorite! I am laughing at your post about sitting in the mini van hoping no one sees you..that was me today! LOL! This table is amazing! I love it!! Going to file it away in my to do list for summer projects. Thank you for sharing!! Hi, Mitra. I was so sad when we sold the mini van I’d had for 20 years! We had bonded and it was part of the family! I’m glad you like the table and you keep filing those projects away! very nice table, thank you for showing﻿. Impressive craft. I will give it a go but on a rectangular shape I think ! Love this! Thanks for sharing! Now I just need to find myself a single & handy man! Nice, I did this 10 yrs ago then last year I took the window off and turned it over, famed in the ends of the legs and made a canopy dog bed out of it. Someday it might become something completely different. Hi, Nancy. What a great idea. I know you have one happy dog!